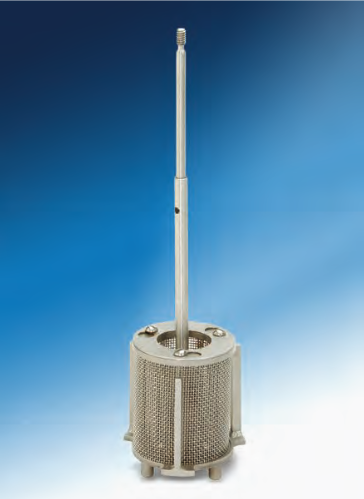 In the dynamic design the catalyst is held in an annular shaped, mesh basket which is attached to the stirrer drive in place of the stirring shaft. The rotating basket then serves as an impeller for stirring the reactants. 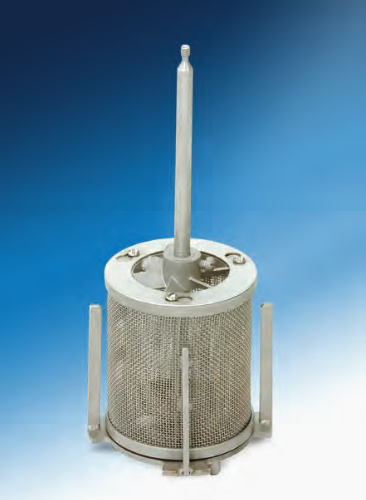 Fixed baffles and coaxial impellers ensure good circulation over the surface of the contained catalyst. The dynamic baskets are available for reactors with volumes of 1000, 1800, and 2000 mL. Dynamic baskets must be installed in reactors equipped with at least 1/4 hp motors to ensure that sufficient stirrer torque and speeds are available for proper operation. Dynamic baskets are interchangeable with static baskets in 1 liter and larger vessels.